Here at DFV we love taco night. However, I always make too much and hate putting all the parts away. Initially that is how this dish was created. We usually have rice and beans with our tacos so the left overs are added to the casserole with a few added extra ingredients. I take the left over taco ingredients and put together the casserole right on the table, cover and refrigerate until the next night for dinner. Tonight was different. We all had a long day and it’s snowing out so we didn’t want to leave the house, which left me to find something quick, easy and warm to eat. Below is how I made it tonight without left overs. I chose Quinoa because it’s a lot quicker to cook than rice. Instead of the sausage you could use whatever you would use for tacos (mushrooms, tempeh, veggies fajitas, seitan, etc…) For the three cups salsa/tomato sauce I use whatever salsa I have left and add tomato sauce to make up the rest of the three cups (you could use just salsa if you have enough.) If you use corn tortillas and don’t use cheese sauce this would be gluten free. If you don’t use cheese sauce you need an extra cup salsa to replace the cheese layer. You may also add shredded vegan cheese to the layers or top. This casserole comes out different every time it’s made depending on what we have used in the tacos or have left over. If you have diced tomatoes, onions, cilantro, spianch or anything else oven safe (I personally wouldn’t add lettuce) throw it in there! Preheat oven to 375 degrees. I used a 8″ x 13″ casserole dish that was 3″ deep. If you are making this recipe exactly make cheese sauce first. Saute sausage and bell pepper in olive oil. Mix corn, black beans and chile’s together and set aside. On bottom of casserole dish spread out 3 tablespoons of salsa mix. Cover with 1/3 of tortillas. Use half quinoa (or rice) and spread over tortillas. Proceed with half sausage mix, half corn mix, half salsa. Another layer of tortillas and above steps. If you don’t have enough tortillas you can cut out the middle layer and keep the remaining tortillas for the top (proceed with another layer of quinoa, etc.) The last layer will be the remaining tortillas. Top with cheese sauce, green onions and olives. Bake for 45 minutes. Serve with sour cream. 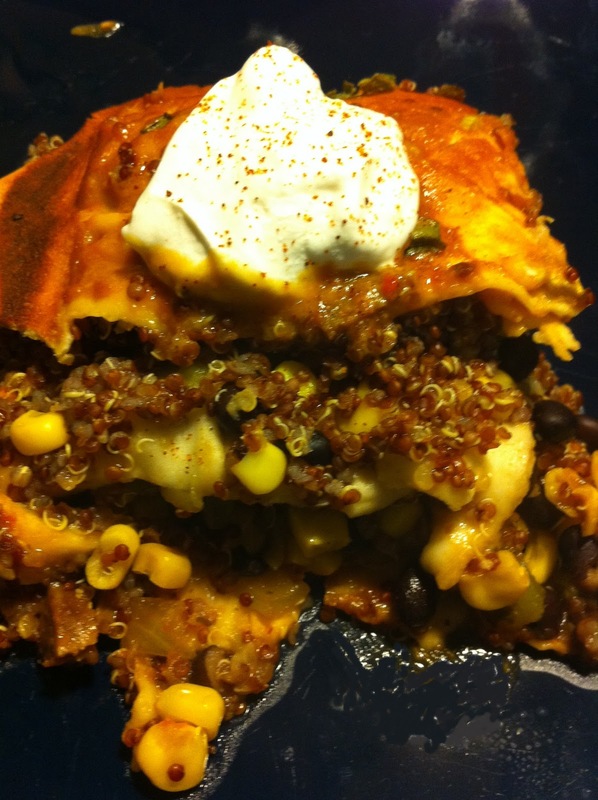 Gallery | This entry was posted in casserole, Gluten Free, Main Course, Mexican. Bookmark the permalink.